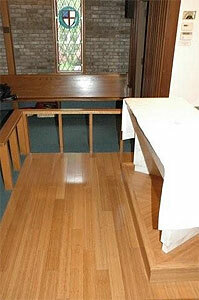 The Church of the Atonement chose bamboo - a renewable resource - for their new chapel flooring. Church of the Atonement's small (100 people) stand-alone chapel was built in 1965, intended for occasional services such as weddings and other celebrations. It invokes an inter-denominational spirit through stained glass windows with the emblems of different Christian denominations. Over the past decade, the chapel showed its years and was being used less-and-less. It needed to be updated both physically and programmatically. Programming came first. The plan was to increase the chapel's use by hosting Atonement's children's services there, and adding Taize services of chant and meditation to its schedule of occasional services. Next, an architect, Tom Fenniman, was retained, based primarily on the aesthetic quality of his previous work with other churches. Indeed, Atonement did not know whether or not he had green sensibilities or qualifications at the time he was retained. "But," points out the Rev. Lynne Weber, Atonement’s spiritual leader, "a raising of green consciousness had already gotten under way here at Atonement when GreenFaith Executive Director Fletcher Harper had spoken several years earlier about green strategies churches could undertake in their daily operations." Atonement had followed up by purchasing its electricity from a renewable energy provider through GreenFaith. "These kinds of things tend to build within a community, and we were blessed that this green awareness got a further boost during the chapel project through the participation of congregation member Ellen Kuhn as a member of the building committee. Ellen served as a champion of the environment both within the committee and in the committee's work with our architect." Some of the green results were the installation of bamboo flooring around the altar, both for its aesthetic quality and for its environmental sustainability – bamboo is a rapidly renewable resource. Atonement also replaced its lighting with new, energy-efficient fixtures and compact fluorescent bulbs. The project was completed in 2003 at a cost of $60,000. The next chapter of the story at Atonement, is how little steps can lead to bigger ones. The church is now considering a substantial renovation project. There are two needs behind this consideration. First, Atonement is grappling with issues surrounding accessibility…the church's suburban hilltop site has meant the development over time of eleven distinct levels in its building, making it difficult for the church’s elderly or disabled members to navigate the building. Second, wanting to increase its number of visitors and build its congregation, Atonement wants to create a more inviting entrance than it has now, and in the process improve its circulation spaces and bathrooms--the same kinds of challenges faced by many older religious buildings. Now, as an essential part of the process, Atonement is looking at how green approaches can both help it meet its programmatic goals (such as the introduction of natural light to make its entrance a more pleasant and welcoming space) as well as its aesthetic goals. Says Lynne Weber: "We're actively talking with our congregation about the needs we have and the ways we can go about meeting them. For instance, we recently sent a letter of need, along with potential floor plans, to our 120 active households, and have already gotten feedback and support from 51 of them. That's very encouraging. Nothing pulls a community together like working towards a better future." Finally, Lynne directs our attention to another important ingredient for success in green building projects. "We've also put together a good team for this building project, which we're calling 'Open Doors, Open Hearts.' Who you pick for such a team is so important. Serving on the team are a member of the vestry who's really good at scheduling and organizing, a person who knows a lot about buildings and grounds issues, our senior warden, someone who's an architect and engineer, and a textile designer with a really good eye for color and interior design. We also asked someone who's long been active in our congregation but who hadn't yet been convinced of the merits of this project, or of green building strategies generally. His presence has kept all of us honest, on the one hand, and I've seen him take a journey to understanding better what this whole process may mean for Atonement and its future, financially, and in terms of better fulfilling our mission. He's now an important advocate for the project."